A boiler’s primary function is to heat the water within the system, to provide hot water and heat to a structure. 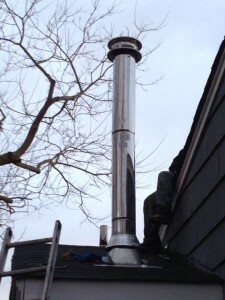 Long Island and Queens homes that use gas or oil energy to feed its boiler system must also have a boiler chimney. A boiler chimney often looks like a small smokestack, located on the roof of a home. Some homes also have the same kind of chimneys for appliances, such as stoves and ovens. These boiler chimneys are similar to fireplace chimneys in that they are flues, which allow gas and hot steam to exit the home. IT IS JUST AS IMPORTANT TO INSPECT, CLEAN, AND MAINTAIN BOILER CHIMNEYS, AS IT IS A FIREPLACE CHIMNEY. A chimney flue that is not functioning properly can cause potentially dangerous problems. If the flue is not ventilating efficiently, it can cause CO2 to back up into the home, a silent, yet deadly killer. Additionally, the back-up or build-up gases and/or steam, which is formed at excessively high temperatures, can be extremely combustible. Inspections: Alliance Chimney’s certified specialists have the knowledge and expertise to test and inspect your boiler chimney, to ensure that it is working efficiently. In doing so, our experts will evaluate the structure of the chimney to ensure there is no damage. They will also check to see if there is proper ventilation and look inside the chimney to assess whether or not there are any blockages, which can be extremely dangerous. Cleaning: Like fireplace chimneys, boiler chimneys may have to be cleaned. The gas and oil vapors which are dispersed into the atmosphere, through the boiler chimney, can cause build-ups. Debris can also cause blockages within the stack, as well. It is possible for the heated vapors to carry and push particles/debris into the stack, where they can become lodged. It is also common for outside debris to get into the stack. In all cases, the chimney must be cleaned to ensure proper ventilation and prevent dangerous problems. Alliance Chimney’s skilled professionals can remove any blockages, as well as clean any residue and build-up, within your boiler chimney. Maintenance/Repairs: If during any visit, we find a problem with or damage to your boiler chimney, you can rest assured that our team can perform the repairs needed. Whether it a dent, crack, loose strap or bolt, Alliance Chimney will repair damages and carry out whatever additional maintenance your boiler chimney may need.